Come along to Blackhawk where you can try your luck at a number of casinos, including Ameristar, Isle of Capri, the Lodge, Mardi Gras and others. There are plenty of penny machines and great blackjack tables!!! Let’s see if we can come home Millionaires! Or have lots of fun trying!!! Lunch is on your own. If you cancel within 24 hours of the event, you will be responsible for a $5 cancellation fee. Please sign up in the Birch dining room to be a part of this event. NR….2017…Romantic Drama…Though widow Addie Moore and widower Louis Waters have been next-door neighbors for decades, they’ve scarcely had any contact since their spouses died. But everything changes when Addie, looking to make a connection, pays Louis a visit. Robert Redford and Jane Fonda star. No need to sign up, just come and enjoy! Calling all seniors who are interested in helping their balance, strength and overall health!!! Join Rita Levine to learn this ancient Asian practice of mental focus, body balance and strength! Come one, come all!! You will start from the beginning and learn the whole process! No need to sign up, just come and enjoy! SUPERBOWL LIII PARTY: RAMS vs. PATRIOTS!!! Plan to come and spend the afternoon cheering on your team! Come watch on our new 80 inch big screen! We will have prizes for the best decked-out fan, pay outs for the football pool and more! We will have food and drinks, so come and enjoy an afternoon of America’s favorite past-time and vote for your favorite commercial! Come have fun! RSVP in your building’s book by January 31 to be a part of this event. Come along to a favorite restaurant! They take great pride in using the finest and freshest ingredients available. Their mouth-watering menu of omelettes, pancakes and frittatas, reasonable prices and elegant surroundings, make Benedict’s the best reason to get up in the morning. Breakfast is on your own. Please look at the menu in your building’s trip book to view the options before you sign up! If you cancel within 24 hours of the event, you will be responsible for a $5 cancellation fee; $10 if it is a 2-van event. Please sign up in the Birch dining room to be a part of this event. 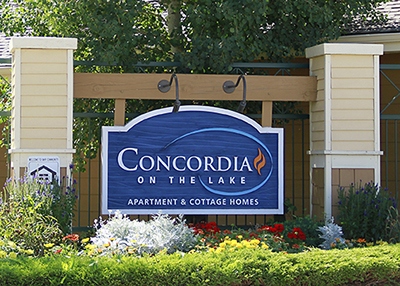 Thank you to those of you who have signed up to welcome new neighbors to their Concordia home! Please plan to attend every meeting so that we can check in on new neighbors and talk about what is working and might need tweaking. Come join in the fun and win some fun prizes! Get into the mood and join your friends for some good fun! Please bring 2 quarters and 8 dimes. We will play for money pots and prizes! RSVP in your building’s book to be a part of this event by Friday, February 1. Calling everyone who likes to sing or play music for fun! Come and share your love for making music. No need to sign up, just come and collaborate! Come and meet the new audiologist, Pat Davis the first Tuesday of every month! He will be replacing Columbine Audiology who has been a wonderful partner for us for the past 15 years. They have moved across town and are downsizing and no longer have the man-power to come over and service Concordia. We are excited to make a new relationship with Pat Davis whom several of our residents already see for their hearing aid needs. Please stop by and meet Pat and see what he can do for you, your hearing and your hearing aids. Please sign up in the Birch dining room for a time slot to stop by and talk with Pat about hearing issues or your hearing aids. 2018….PG 13…..A London writer bonds with the colorful people of Guernsey as she learns about the book club they formed during WWII German occupation. Lily James and Michael Huisman star. No need to sign up, just come and enjoy! The Rocky Mountain Quilt Museum will be at the Event Center presenting a program about their quilts from the 1930’s. You will learn about the fabrics and perhaps stories that go along with the quilts! You can come and touch these quilts and study the fastidious workmanship! RSVP in your building’s book by February 5 to be a part of this event. Please join us for this very fun, informative group trivia game! You will be put into groups (a new one each time) and answer geography trivia questions! It is a fun way to share your knowledge, gain knowledge and meet new friends! At the end of the year, points are totaled and the three players with the most points win Activity gift certificates! Come one, come all!!! No need to sign up, just come and have fun! Join Active Minds® as we tell the stories of the original inhabitants of Colorado. From Mesa Verde to the high plains, we will trace the civilizations of the Ute, Cheyenne, Arapaho, Pueblo and other tribes as we seek to understand Colorado’s Native American history and legacy. RSVP in your building’s book by Wednesday February 6 to be a part of this event. As you have probably heard, there has been a merger of Littleton Fire Rescue with South Metro Fire Rescue. Along with the merger, there are new guidelines for fire safety. The Fire Chief will be here at Concordia talking with residents about the new guidelines and what the rules are for fire safety here at Concordia. This is a very important meeting for all to attend as you can ask questions and get clear guidelines as to what you are to do in case of a fire. RSVP in your building’s book by Wednesday, February 7 to be a part of this event. Be sure not to miss Krista, CNA, who visits Concordia the first Thursday every month to keep an eye on your blood pressure. Come on down to the Cedar commons and she will check and notate your blood pressure reading for your information and a way for ongoing health monitoring for your doctor. No need to sign up, just come. Let’s go enjoy a lunch at the new restaurant in Park Meadows. Just like the one we have been to in Downtown, this is a Brazilian steakhouse complete with a fabulous “salad bar” which has much more than salad fixings! It has everything that will make a nice lunch! If you would like meats with your lunch, you can add that on. Please look at the menu in your building’s book prior to signing up. Lunch is on your own. If you cancel within 24 hours, you will be responsible for a $5 cancellation fee; $10 if it is a 2 van event. Please sign up in the Birch dining room to be a part of this event. Come and enjoy being creative and innovative! You will be given materials to make two Valentine’s Cards to be sent to your loved ones! It is always wonderful to receive something homemade from the heart, don’t you think? RSVP to be a part of this event by Tuesday, February 5 so that we can purchase the materials! Hope to see you there! 2007 PG 13…Drama/Romance… When she loses her beloved husband, Gerry, to a brain tumor, grieving widow Holly Kennedy learns that he left a series of letters behind to help her cope with the pain of living without him. Hillary Swank, Gerard Butler, Kathy Bates and Harry Connick, Jr. star in this film. No need to sign up, just come and enjoy! Your Colorado Symphony and Conductor Christopher Dragon pay homage to two Broadway composers who redefined the theatric genre again and again with their show-stopping scores that set the stage for their beloved musicals. With spectacular featured vocalists Scarlett Strallen, Debbie Gravitte and Hugh Panaro, this evening of song and sound will showcase tunes from hits like Jesus Christ Superstar, Evita, Phantom of the Opera, Cats, A Funny Thing Happened on the Way to the Forum, Sweeny Todd: The Demon Barber of Fleet Street, Gypsy, and more. $45.10 for front orchestra tickets. If you cancel and we cannot find a replacement, you will be responsible for $45.10. If you cancel within 24 hours of the event, you will also be responsible for a $5 cancellation fee; $10 if it is a 2 van event. Please sign up in the Birch dining room to be a part of this event. Be sure not to miss this wonderful group along with the Fiesta Colorado Dance Company! MUSIC IN MOTION! Twirling multicolor skirts, spinning like petals caught in a cool breeze on a sweltering summer night. Let the Latin rhythms seep deep into your soul, with your heartbeat keeping time. It’s a sizzling blend of rhythm and romance, blazing brass and fiery dance, guaranteed to leave you smoldering. Bring a fan, it’s gonna get hot! $15 will be charged for parterre seats and $25 for parterre box seats. Please mark whether you want regular seats or box seat next to your name. If you cancel and we cannot find a replacement, you will be responsible for $15 or $25 depending on the ticket you chose. If you cancel within 24 hours of the event, you will also be responsible for a $5 cancellation fee; $10 if it is a 2 van event. Please sign up in the Birch dining room to be a part of this event. Nestled in an old building in Northeast Denver Curtis Park area, we will enjoy a relaxing, special afternoon complete with quiche, salad or soup, pastries and plenty of choices of tea! $30 will be charged to your account for this special tea including the tea, tax and tip. Let’s celebrate good friends and good health this Valentine’s Day! If you cancel and we cannot find a replacement, you will be responsible for $30.00. If you cancel within 24 hours of the event, you will also be responsible for a $5 cancellation fee; $10 if it is a 2 van event. Please sign up in the Birch dining room to be a part of this event. Calling all want-to-be artists or already working artists!!! This class is for ANYONE who loves art and would be interested in creating a work of art in a 2 hour period right in your community! A trained art teacher will come to our Event Center with all supplies for each person to paint a picture. She will then walk us through the steps of creating the picture she has planned. What can you lose? There can only be 15 people in the class, so be sure you sign up early to make sure you get on the list! First come, first served! This is a FREE class for Concordia residents, so take advantage of this opportunity! Your interest in this class will determine whether they will come monthly or not. If you cancel and we cannot find a replacement, you will be responsible for a $5 cancellation fee. Please sign up in the Birch dining room to be a part of this event. Don’t miss this fun way to meet neighbors and get involved! This month, we will play BUNKO! This is a great party game that needs NO strategy…you just roll dice and let the luck fall where it may! Please bring 4 quarters to play! No need to sign up, just come and have fun! It’s another fabulous year with Chef Brian! What’s better than chocolate for dinner? Especially right before Valentine’s day? Brian will be preparing cocoa spiced pork tenderloin with berry sauce, salad with chocolate vinaigrette and a flourless chocolate cake! $15 will be charged to your account for lunch. *The cost has never changed for the 15 years Brian has been here and the cost of food has gone up, so we are finally having to raise the charge for this class. If you cancel and we cannot find a replacement, you will be responsible for $15. Please sign up in the Birch dining room to be a part of this event. 1993…..PG…ROMANTIC COMEDY…Starring Tom Hanks and Meg Ryan.. Fate and a tenacious 8-year-old boy conspire to unite lovelorn widower Sam Baldwin and unhappily engaged journalist Annie Reed in this Oscar-nominated romantic comedy inspired by the 1957 classic An Affair to Remember. No need to sign up, just come and enjoy! It has been awhile since we enjoyed this fantastic orchestra! You will be treated to the Shostakovich 2nd piano concerto performed by Italian concert pianist Antonio Di Cristofano and the Lamont orchestra along with Sibelius’ 2nd Symphony. This will be a very exciting concert! $5 will be charged to your account for parterre/box seating. If you cancel and we cannot find a replacement, you will be responsible for $5. If you cancel within 24 hours of the event, you will also be responsible for a $5 cancellation fee; $10 if it is a 2 van event. Please sign up in the Birch dining room to be a part of this event. Join soprano Margaret Ozaki Graves for an afternoon of Shakespearean drama and romance. Meet Juliet, Desdemona, and Ophelia as shaped through the well-known settings by Bellini, Verdi, and Gounod, as well as unfamiliar gems by Berlioz, Amy Beach, and operetta composer Arthur Sullivan. $19 will be charged to your account for your ticket. If you cancel and we cannot find a replacement, you will be responsible for $19. If you cancel within 24 hours of the event, you will also be responsible for a $5 cancellation fee; $10 if it is a 2 van event. Please sign up in the Birch dining room to be a part of this event. Come and join us for a whole lot of fun!! Each week, we will play a different game on the WII video game console. This is an active video game where you do the actions and it is almost like you ARE bowling or standing on a tee box on a golf course! It is fun, friendly competition and you can get your exercise without leaving the community! The Concordia Calendar will show which sport is being played on what day. No need to sign up, just come on over and either play or watch. It’s LOTS OF FUN! Deborah Lemon-L’Heureux from Comcast returns to answer questions about your Comcast bill, your service or any other concerns you may have. She will repeat the presentation on the new X1 voice remote as well. If you want her to look privately at your bill or service, please sign up in one of the ten time slots on the sheet at sign up. First come, first served. Please sign up in the Birch dining room to be a part of this event. Don’t miss this wonderful evening of classical cello! Dean will perform from the large repertoire of love songs and jazz standards in honor of Valentine’s Day! He will also play some music composed especially for the mellow, rich sound of the cello! RSVP in your building’s book by Tuesday, February 12 to be a part of this event. Don’t miss this wonderful way to have a girl’s day out with friends! This is a shopper’s paradise! Flatirons Crossing Mall combines the best of the Colorado outdoors with over 185 of the finest restaurants and retailers. There is a Macy’s, Nordstrom, and Dillard’s, in addition to Bath and Body Works, The Gap, Crate and Barrel and much, much more! There is a food court for lunch. Lunch is on your own. If you cancel within 24 hours of the event, you will be responsible for a $5 cancellation fee; $10 if it is a 2 van event. Please sign up in the Birch dining room to be a part of this event. 1957..NR…ROMANCE/DRAMA.. Although each is already engaged to another, Nickie Ferrante (Cary Grant) and Terry McKay (Deborah Kerr) meet on an ocean liner and fall deeply in love. Tempting fate, they agree to meet at the Empire State Building in six months if they still feel the same way. But a tragic accident prevents their rendezvous, and the lovers’ future takes an uncertain turn. This classic love story was nominated for four Academy Awards, including Best Music. No need to sign up, just come and enjoy! Experience the connection between music and the way we think. Ponder the classic works of Dvorak’s Legend, Ellington’s Don’t Get Around Much Anymore, and more in a mindful collaboration with guest conductor Maestro Debashish Chaudhuri and magician Trenton Gunsolley. This program is sure to blow your mind! $20 will be charged for your ticket. If you cancel and we cannot find a replacement, you will be responsible for $20. If you cancel within 24 hours of the event, you will also be responsible for a $5 cancellation fee; $10 if it is a 2 van event. Please sign up in the Birch dining room to be a part of this event. Join us for a great lunch out at one of Bel Mar’s favorites! The Roadhouse has a very fresh vibe with a menu that is edgy and includes interesting combinations of ingredients! They offer salads, soups, burgers, sandwiches, pizzas, etc… all with some kind of a twist! Lunch is on your own. Please peruse the menu in your building’s book prior to signing up for this event. If you cancel and we cannot find a replacement, you will be responsible for a $5 cancellation fee; $10 if it is a 2 van event. Please sign up in the Birch dining room to be a part of this event. 1968… NR…Romantic Comedy… Beverly Boyer (Doris Day) is a happily married housewife whose life changes dramatically when the president of a soap company decides she’s the perfect TV pitchwoman for his product. After the ads air, Beverly becomes famous and a better breadwinner than her doctor husband (James Garner) — who doesn’t cope well with the change! The Boyers scramble to patch up their crumbling marriage in this classic 1960s comedy. No need to sign up, just come and enjoy! This is a basic computer class for anyone who has an iPad, Kindle, smartphone, laptop and needs to know the basics. Have you had one of these and not known how to even start with it? This is your class! We will cover the basics on different devices. Please bring your device and any user name and passwords you have so we can get in and work! This class will be limited to the first 15 people who sign up! Please sign up in the Birch dining room to be a part of this event. For a delayed celebration of President’s Day, Lincoln discusses the 15 Presidents that preceded him, describing their importance and his own connections with them. He also provides the highlights of his own 16th Presidency, including the Civil War, emancipation and Gettysburg Address. RSVP in your building’s book by Wednesday, February 20 to be a part of this event. Don’t miss this great opportunity to see an exhibition featuring the diverse artistic talents and techniques of artist members! The FAC exhibition staff will jury artwork to select an exhibition that features engaging and creative content along with the highest level of craftsmanship. We will also see an exhibit featuring the work of Jefferson County arts students as curated by the teachers. The show focuses on the unique creative process of the students. Over 50 students from our local community will be on display in this diverse and dynamic exhibition. $5 will be charged for your admission into the gallery…the tour is on your own. If you cancel and we cannot find a replacement, you will be responsible for $5. If you cancel within 24 hours of the event, you will also be responsible for a $5 cancellation fee; $10 if it is a 2 van event. Please sign up in the Birch dining room to be a part of this event. Have you ever wondered what your handwriting reveals about you? Have you ever seen something in someone else’s handwriting that is quirky and you wonder what it means? This is your class! Abbie Lawrence, a certified handwriting analyst, will be at Concordia to share her knowledge about personality traits and handwriting specifics. From a small handwriting sample, Abbie’s expert handwriting analysis skills will profile remarkable details about personality traits such as loyalty, organization, creativity, honesty, temper, willpower, ego and many more! You will do some handwriting of your own and talk about some characteristics of your penmanship. This is sure to be a fun, eye-opening class! RSVP in your building’s book to be a part of this event by Wednesday, February 20. 1979…PG…Romance..Diane Lane stars as Lauren, a young American girl whose love of books finds a soul mate in Daniel (Thelonious Bernard) — and romance blossoms. When Daniel slugs the egomaniacal director boyfriend of Lauren’s self-absorbed actress mother (Sally Kellerman), the two are forbidden to date. But with the help of an aging pickpocket (engagingly played by Laurence Olivier), the two young lovers run off to Venice and spark an international chase. No need to sign up, just come and enjoy! Featuring Dvorak’s New World Symphony and Hayden’s Sinfonia Concertante featuring our own soloists from the Littleton Symphony! In addition, we will hear Rimsky-Korsakov’s Caprissio Espagnol. This concert is held at Littleton United Methodist Church. $19 will be charged for your ticket. If you cancel and we cannot find a replacement, you will be responsible for $19. If you cancel within 24 hours of the event, you will also be responsible for a $5 cancellation fee; $10 if it is a 2 van event. Please sign up in the Birch dining room to be a part of this event. Don’t miss this fun opportunity to go to the Magness Arena to see the DU Pios show their stuff! The Denver Pioneers men’s ice hockey team is a National Collegiate Athletic Association Division I college ice hockey program that represents the University of Denver. Coats and mittens are recommended. There must be 10 signed up for this event. $20 will be charged to your account for the ticket. If you cancel and we cannot find a replacement, you will be responsible for $20. If you cancel within 24 hours of the event, you will also be responsible for a $5 cancellation fee; $10 if it is a 2-van event. Please sign up in the Birch dining room to ba part of this event. Let’s go check out the remodel and overhaul of our sister business! In the brand new building, we will enjoy a nice, buffet brunch with an omelet station, breakfast favorites, pastries, salads and more! Brunch is on your own at $15.95 plus beverage, tax and tip. If you cancel within 24 hours of the event, you will be responsible for a $5 cancellation fee; $10 if it is a 2 van event. Please sign up in the Birch dining room to be a part of this event. Be sure not to miss this premier group of young musicians including the Conservatory Orchestra, String Ensemble and full orchestra! They will be performing Bernstein’s Mambo Mairs’ Dreamdancing, Humperdink’s Prelude to Hansel and Gretel, Hindemith’s Symphonic Metamorphosis and other selections to be announced from stage. $10 will be charged for your ticket in Boettcher concert hall. If you cancel and we cannot find a replacement, you will be responsible for $10. If you cancel within 24 hours of the event, you will also be responsible for a $5 cancellation fee; $10 if it is a 2 van event. Please sign up in the Birch dining room to be a part of this event. Let’s check out a neighborhood restaurant for a lovely ladies’ breakfast! It has been awhile since we dined at Zest and now they offer breakfast! Situated at the corner of Wadsworth and Yale, this might become a new favorite for you and friends or family to dine! The menu includes omelets, crepes, corned beef hash, biscuits and gravy, huevos rancheros and much, much more! Breakfast is on your own. If you cancel within 24 hours of the event, you will be responsible for a $5 cancellation fee; $10 if it is a 2 van event. Please sign up in the Birch dining room to be a part of this event. Come and enjoy meeting new neighbors, having an afternoon drink and playing pool! Everyone is welcome! This will be a fun way to celebrate the new year! Who knows, maybe this will become a habit! Please join us for fun! Drinks are on your own, it is happy hour so there are great deals! Pool is free, so come and play!!! If you cancel within 24 hours of the event, you will be responsible for a $5 cancellation fee; $10 if it is a 2 van event. Please sign up in the Birch dining room to be a part of this event. 1998…PG-13…Drama/Romance…When the grim reaper (Brad Pitt) comes to collect the soul of megamogul Bill Parrish (Anthony Hopkins), he arrives with a proposition: Host him for a “vacation” among the living in trade for a few more days of existence. Parrish agrees, and using the pseudonym Joe Black, Death begins taking part in Parrish’s daily agenda and falls in love with the man’s daughter (Claire Forlani). Yet when Black’s holiday is over, so is Parrish’s life. Do you hear the dinner bell ringing? Come along with your friends and neighbors for a good, down home meal of steak, chicken, pork chop, salmon or any other of many choices! Dinner is on your own. Please look at the menu in your building’s trip book to view the options before you sign up! If you cancel within 24 hours of the event, you will be responsible for a $5 cancellation fee; $10 if it is a 2 van event. Please sign up in the Birch dining room to be a part of this event. Don’t miss this opportunity to spend time with friends and neighbors while enjoying some treats! Come and unwind in the company of old friends and new! This is a great way to meet people in the community! Come join in the fun!! Please RSVP in your building’s book to be a part of this event by Monday, February 25 to be a part of this event. Don’t miss this wonderful, soulful choir-FREE! This choir performs spirituals, freedom songs and gospel selections. Featured on the program will be The Dream and the Dreamer, a commissioned work inspired by the life of Rev. Dr. Martin Luther King, Jr. and composed by M. Roger Holland, the Project’s director. If you cancel within 24 hours of the event, you will be responsible for a $5 cancellation fee; $10 if it is a 2 van event. Please sign up in the Birch dining room to be a part of this event. Don’t miss this great buffet restaurant where you get to make your salad EXACTLY as you like. There are numerous choices on the salad bar as well as wonderful soup and bread choices. You will also be able to choose from a variety of pasta dishes as well as have a yummy ice cream sundae or brownie. Lunch is only $8.99 plus tax and tip for a healthy meal!! Lunch is on your own. If you cancel within 24 hours of the event, you will be responsible for a $5 cancellation fee; $10 if it is a 2 van event. Our first group meeting was successful and we are SO lucky to have a retired Psychiatric Nurse, Group grief support facilitator in our very own Pat Burgbacher at the helm. She brings decades of experience and practice to this group and will prove to be a wonderful asset as she helps us understand the grieving process and helps us explore different things each of us can do to help ourselves or others through this process. This is a peer support group, led by a wonderful neighbor who has some background and experience in this subject and we are friends getting together to listen, give a hug, suggest what might have helped them, etc… We will see where this goes…No need to sign up, just come and be a good listener and a warm shoulder. Don’t miss another wonderful art presentation by Art Historian, Cynthia Peer! View a beautiful slide show presentation as wonderful works of art with a theme of “Love” in them are detailed, highlighting great works of art by, Bernini, Edgar Degas and Toulouse Lautrec and more! RSVP by Tuesday, February 26 to be a part of this event. Roxy Sheldon from Sheldon designs-the jeweler who comes to Concordia, will be here with her church choir performing for Concordia residents! Don’t miss this wonderful way these community members are giving back to their community! Come and enjoy good music and fellowship and some yummy cookies also! RSVP by Tuesday, February 26 to be a part of this event.